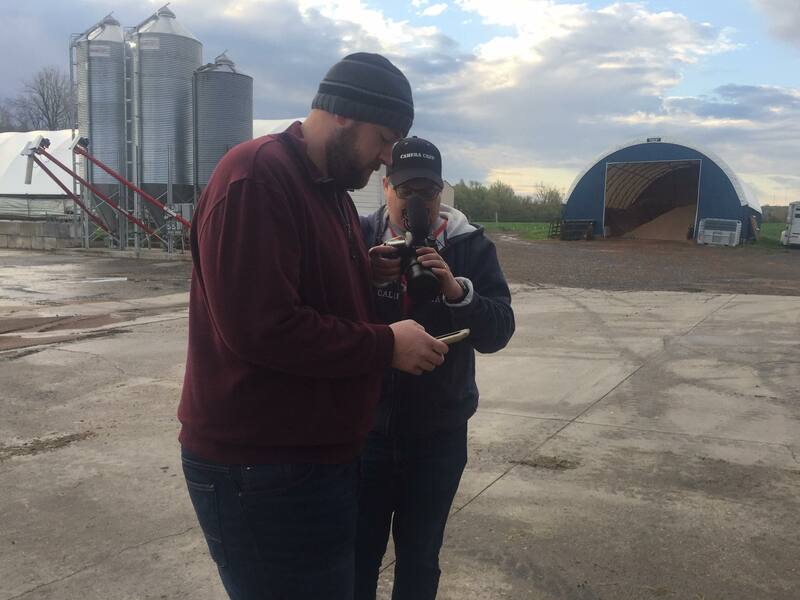 During the next two months, the Lely marketing team will be visiting farms to capture photos and videos for use in future projects. It’s my favorite part of my job and I am excited to share these stories. At the beginning of May, myself and Bing Bang, a partner agency, packed our bags and traveled to Murrock Farms in Watertown, New York. We left under cloudy skies following a rainy weekend in Iowa and, unfortunately, the rain followed us east. The soggy weather didn’t dampen our time with the Murrocks, though. Murrock Farms is a family operation that includes Darrell and his sons, Jeffery and Dillon. The farm, which has been in the family since 1912, was started by Darrell’s grandfather. It’s changed over the years, with perhaps the most significant changes occurring in the past six years. In 2009, Murrock Farms became an organic dairy and since transitioning to automated milking in January 2016 with five Austronaut A4 automated milking systems, the family hasn’t looked back. Additionally, the family utilizes Lely Grazeway selection boxes. The Murrocks welcomed us and were great sports despite us asking them to do things out of their comfort zones. They even let us tag along to a customer appreciation BBQ hosted by Scott Zehr from Select Sires, who the Murrocks use for their breeding and reproductive management. On a side note, if you ever run into Scott and he’s barbequing, be sure to grab a piece of chicken. Delicious! The rain we brought with us (sorry, guys!) stalled the planting of 3,000 acres of corn, soybeans, wheat and hay, that they use to feed their herd. It also prevented the herd from getting out to the pasture to graze. Darrell said he considers the addition of the robots to be a blessing. Dillon spends the most time with robots and cows, so we talked with him about all the changes they have implemented. He said he’s been thrilled with the improvements he’s seeing in their herd listing production, cow health, reproduction and costs. Plus, he says everyone is a lot happier. “It's definitely more relaxed around here. It doesn't seem to be as such a rush in the barn. It's kind of, ‘Go about your day and enjoy what you're doing,’” he said. What struck me the most about our conversation with Dillion was the excitement he has for the future, both his and that of the dairy industry. When I asked him what he sees five or ten years down the road, he said he hopes to have more barns. There’s no doubt in his mind that all his farms will be automated. “It’s the future. It’s my future,” he said. Cindy Van Donselaar is Marketing Coordinator Lely North America.